Review • “Straight” thoughtfully and humorously poses questions about living authentically, and shows the complications of sexual labels. (Courtesy photograph by JayC Stoddard) Dallon D. Thorup as Chris, John Valdez as Ben and Andrea Peterson as Emily in Utah Repertory Theater's "Straight." There’s a squeal actor John Valdez makes in “Straight,” an “eeee” that’s beautifully rich in the way it captures the trap his character, Ben, has created for himself. 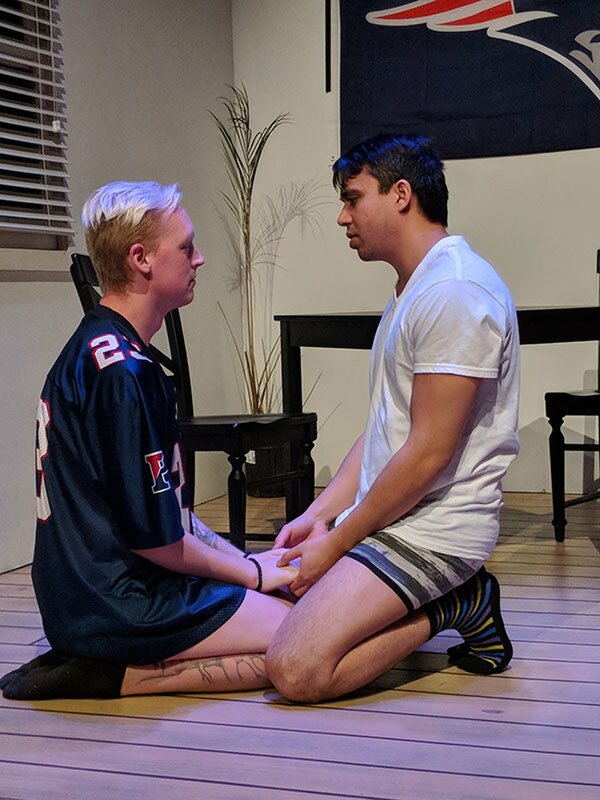 It’s a scene in Utah Repertory Theater Company’s new production where Ben is forced to introduce Chris (Dallon D. Thorup), his secret gay hookup, to Emily (Andrea Peterson), his longtime girlfriend. The sound escapes as Ben sees the pair are hitting it off and realizes his secrets might come out. It’s a perfect moment in this multilayered drama, which thoughtfully and humorously poses questions about living authentically. The play — which experienced some turbulence before this production opened at the Sorenson Unity Center in Salt Lake City — explores the relationships of a 20-something man who doesn’t want to admit he’s gay. Ben is physically attracted to men, sure, but he’s also more than that label, he says. (Courtesy photograph by JayC Stoddard) Andrea Peterson as Emily and John Valdez as Ben in Utah Repertory Theater's "Straight." Under JC Carter’s direction, the play’s smart, millennial characters are beautifully realized by a well-balanced cast, who deliver their quick-witted dialogue — and their characters’ interruptions — with authenticity. 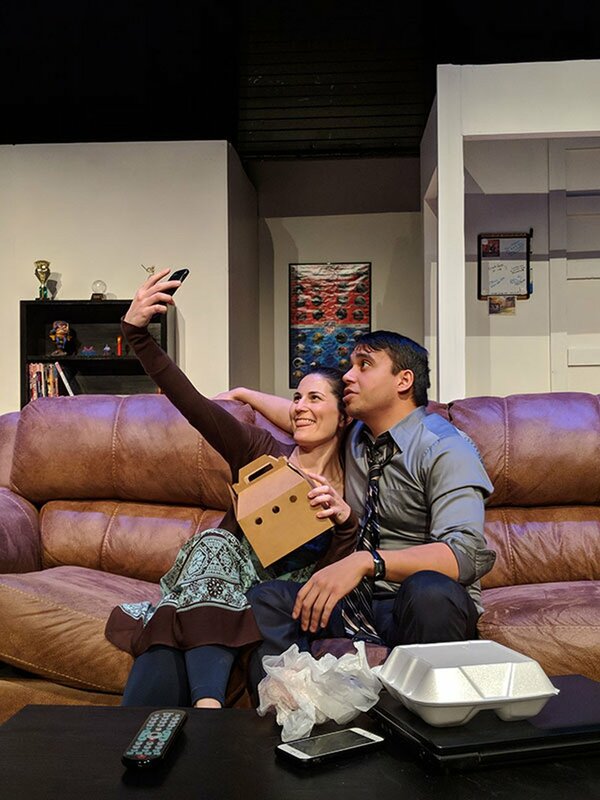 “Content is king, and context is God,” said playwright Drew Fornarola of watching the show’s debut in a Times Square off-Broadway theater two years ago, which led, eventually, to this regional premiere at the Sorenson Unity Center’s Black Box theater. Last fall, officials at the Salt Lake City-operated community center sparked a First Amendment debate after determining that the adult themes of “Straight” didn’t suit the facility’s new “family-friendly mission.” But Utah Rep reached an agreement with facility officials, and the theater company agreed to plan educational events in conjunction with the show’s run. (Courtesy photograph by JayC Stoddard) Dallon D. Thorup as Chris and John Valdez as Ben in Utah Repertory Theater Company's "Straight." The play’s themes of sexuality and attraction should spark critical conversations in Utah, said Mindy B. Young, development director for Equality Utah, noting how the director had decorated Ben’s apartment with several images of LDS temples. She participated on the talkback panel with the playwrights, the cast and director, as well as other Utahns who work with gay, lesbian, bisexual and transgender youth. Despite the popular depiction of coming-out announcements in movies and TV shows, in reality “I’m coming out every day,” said Andrew Hayes, of the University of Utah’s LGBT Resource Center. To which an audience member responded with counsel she offers her gay children: Coming out isn’t as important as letting someone in. When • Friday-Saturday, 7:30 p.m.; Sunday, March 25, 3 p.m.
Tickets •$17-$20 at UtahRep.org/tickets or at the door.